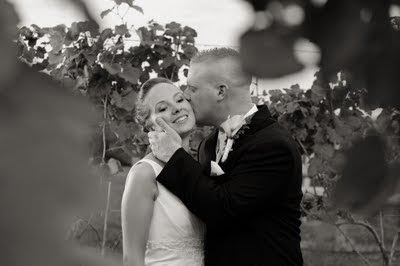 One of me working a vineyard wedding a few weeks back. Thanks to Emily Crowley for use of the pic! Here are two of the outputs. Both at TTL EV -1.0 fired using RadioPoppers. While the sun was in and out that day, overall the sky was overcast and a bit dreary. The idea was to provide a kiss of directional light against their side to give a little dimension and pop to an otherwise plain image. The vines help frame the image just a bit as well.